Mellowed for 12 Years in handmade oak casks, this smooth, sweet dram offers rich rewards for those who like to Dig Deeper. We lose a fair bit to the angels though, almost a third of every cask has disappeared into the ether before we're ready to bottle. Our Handsome Distillery is sited on the river Tay in the Central Highlands of Scotland, a stone's throw from the birthplace of our founder, and Pioneer of Blending, John Dewar. With land acquired from the Marquees of Breadalbane and architecture designed by Charles Doig, the distillery rose up to begin production in 1898. 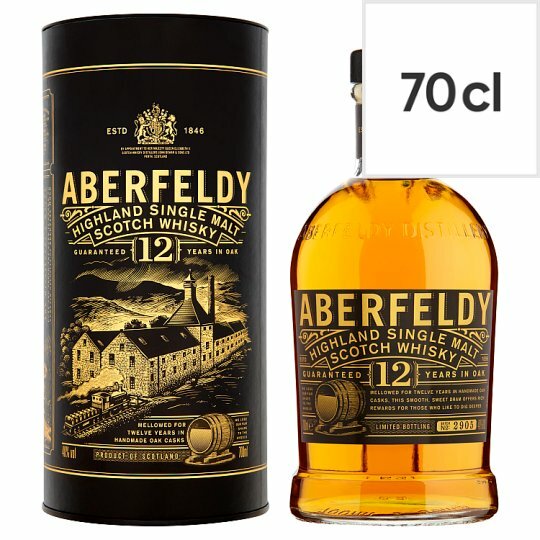 In John's Bonnie Hometown of Aberfeldy, his family found men who knew the secrets of superb whisky. Today, we still use time-honoured techniques like long fermentation to conjure rare honeyed notes, and draw water from the Pitilie Burn, renowned for its quality and Promise of Gold. The site of our distillery was chosen for its supply of good water and the railway that linked it to Perth. Brought barely for our maltings and oak for our coopers before conducting the precious golden liquid to market. The Puggy Engine resides at the distillery to this day.